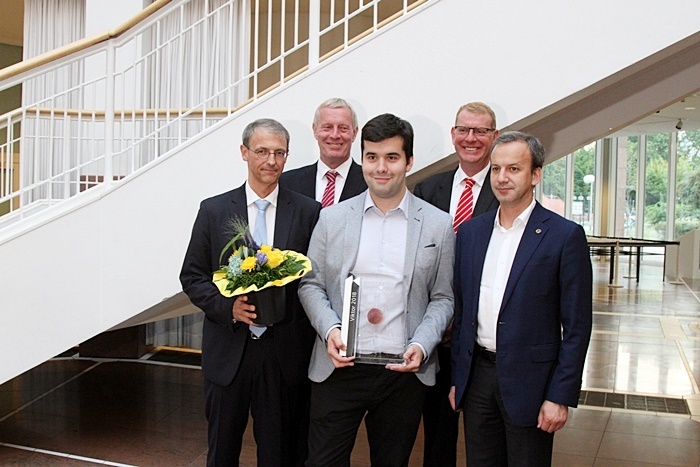 7/17/2016 – With a fine game against Ruslan Ponomariov Maxime Vachier-Lagrave won the Sparkassen Chess-Meeting in Dortmund with one round to go. 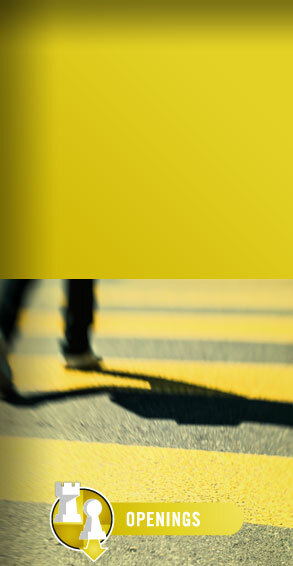 He leads with 5.0/6 and is 1.5 points ahead of his closest rivals Leinier Dominguez Perez and Fabiano Caruana. 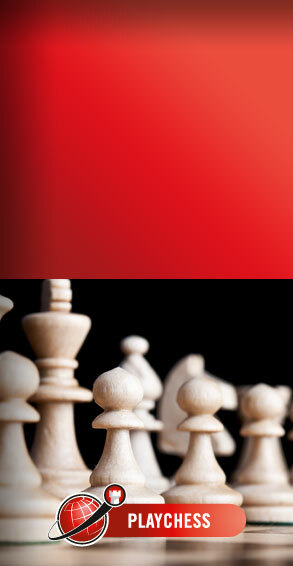 The other decisive game of round six was Caruana's smooth victory against Rainer Buhmann. Evgeniy Najer and Dominguez Perez drew after 54 moves, Liviu-Dieter Nisipeanu and Vladimir Kramnik after 146 moves. 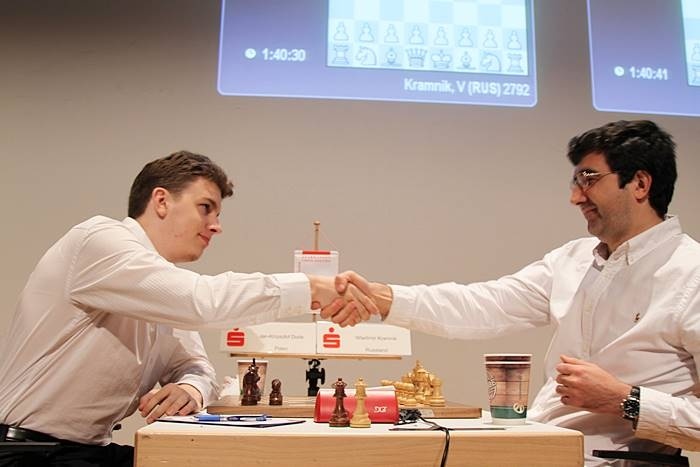 7/15/2016 – After a long fight the top game between Vladimir Kramnik and Fabiano Caruana in the fifth round of the Sparkassen Chess-Meeting in Dortmund ended in a draw. 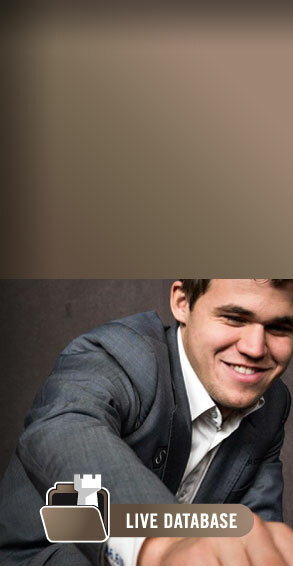 But Maxime Vachier-Lagrave and Ruslan Ponomariov could win. 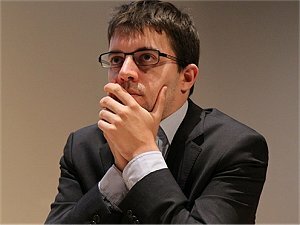 Vachier-Lagrave played against Najer and showed how well he knows the Najdorf. Ponomariov won against Buhmann. Liviu-Dieter Nisipeanu and Leinier Dominguez drew. With two rounds to go Vachier-Lagrave leads with 4.0/5. 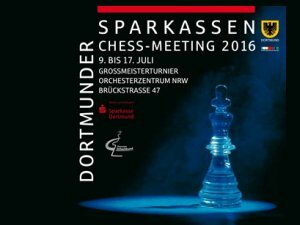 7/13/2016 – In round four of the Sparkassen Chess-Meeting Dortmund Maxime Vachier-Lagrave won against German grandmaster Rainer Buhmann. Long time Buhmann's Breyer looked solid but then the French grandmaster opened lines with a tricky pawn-break. The three other games ended in a draw: Liviu-Dieter Nisipeanu could not convert an advantage against Evgeny Najer, Fabiano Caruana found no recipe against Leinier Dominguez' Petroff and Ruslan Ponomariov and Vladimir Kramnik also drew without too much excitement. 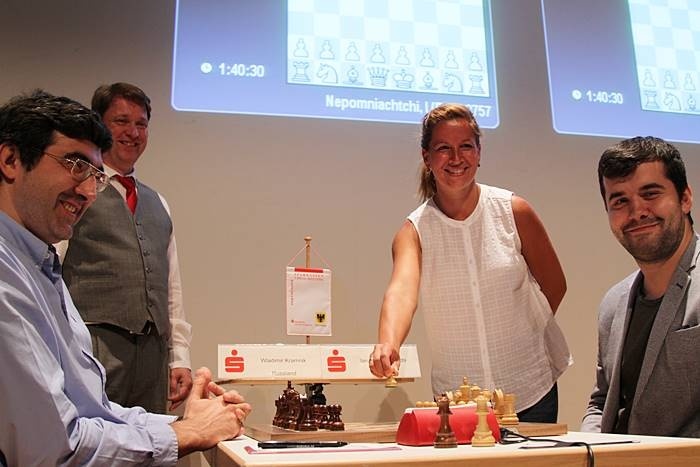 7/12/2016 – Round three of the Sparkassen Chess-Meeting in Dortmund was a delight for spectators. 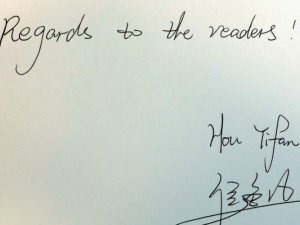 This was to a huge part due to Vladimir Kramnik, ten times winner in Dortmund, who really seems to be inspired by the flair of this tournament. 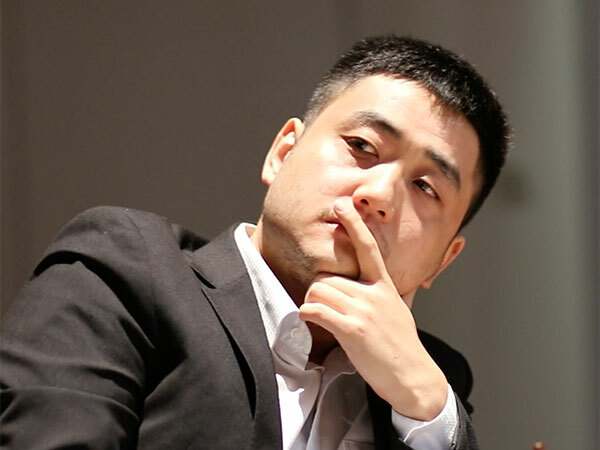 The former World Champion played with White against Rainer Buhmann and initiated a brilliant sacrificial attack in the spirit of Mikhail Tal. But Buhmann defended well and saved a draw! 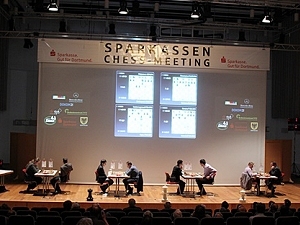 7/10/2016 – With four interesting games of which two had a winner the "Sparkassen Chess Meeting" in Dortmund is off to a promising start. 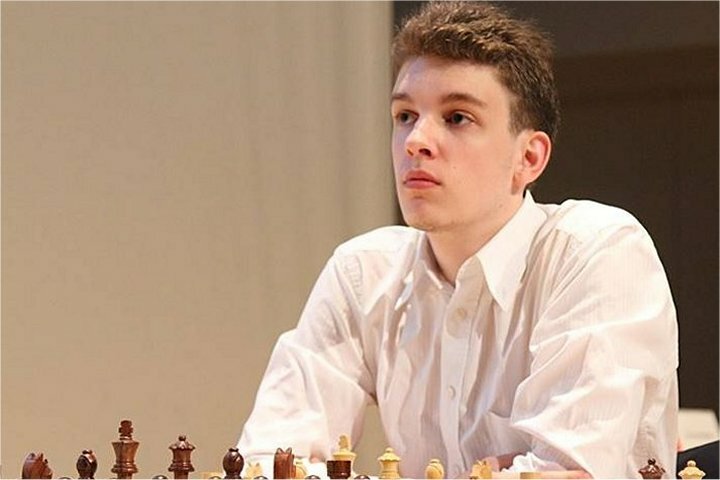 Defending champion Fabiano Caruana wanted too much against Maxime Vachier-Lagrave and lost, while German Grandmaster Rainer Buhmann did not want enough and also lost. Leinier Dominguez Perez drew a long endgame against Vladimir Kramnik and Liviu-Dieter Nisipeanu played a tactical draw against Ruslan Ponomariov. 7/7/2016 – On Saturday, the 44. 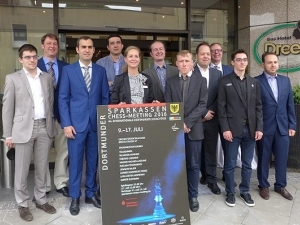 Sparkassen Chess Meeting begins in Dortmund. 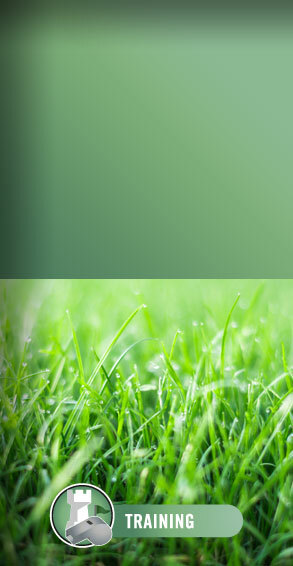 From 9th to 17th July some of the world's best players compete against the best German players. 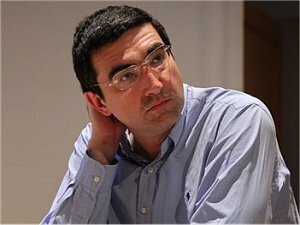 Vladimir Kramnik will play his 22nd tournament in Dortmund and hopes to win his eleventh title. 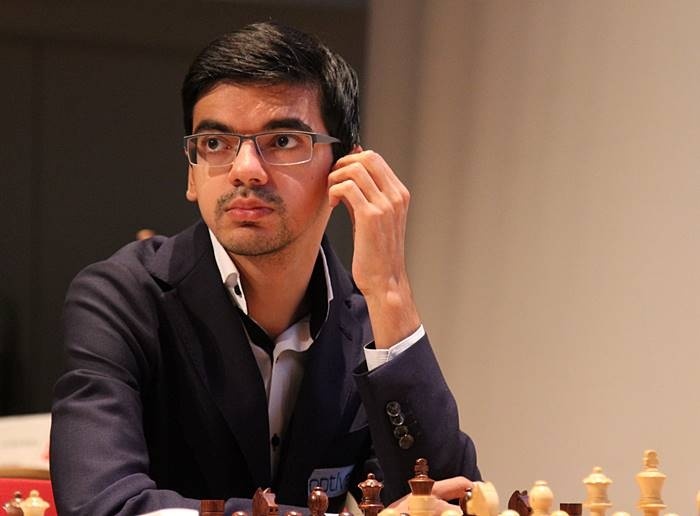 But he has strong rivals such as Fabiano Caruana, the winner of the two previous events, or Maxime Vachier-Lagrave, currently number four in the world. 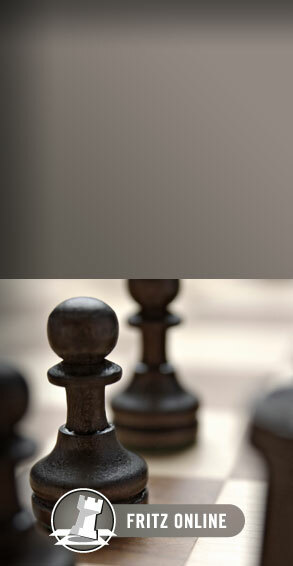 7/20/2005 – The Sparkassen Chess Meeting was a great success, especially from the point of view of chess reporting. After every round TV ChessBase broadcast interviews with experts and with the players themselves, hot from the games they had just finished. 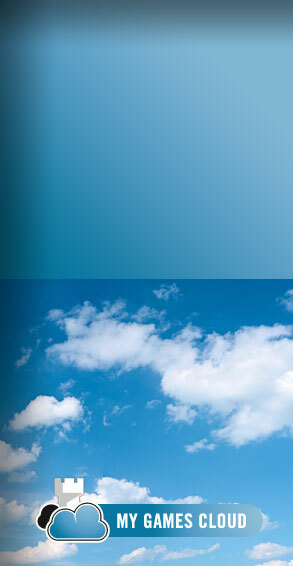 If you missed these great shows not to worry: there are archive links to them. 7/17/2005 – This is what everybody was waiting for: the underdog, bottom seed, finishes one of the strongest tournaments in the world in first place. And a local boy at that. Arkadij Naiditsch clinched it with a last-round draw against Peter Svidler, while his main rivals Loek van Wely and Vladimir Kramnik failed to catch him. 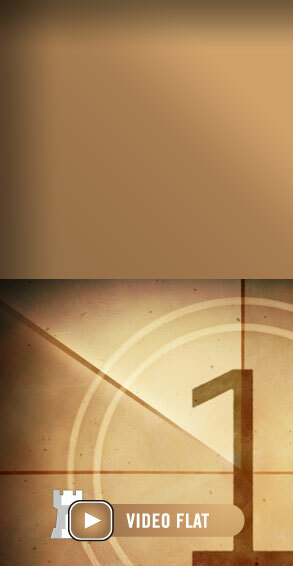 Now with full report. 7/16/2005 – Arkadij Naiditsch, the lowest-rated player, is still in the lead in Dortmund, but three top GMs are in hot pursuit one round before the end of the Sparkassen Chess Meeting: van Wely, Kramnik and Svidler. Kramnik achieved this by beating Nielsen, and both players afterwards analysed their game for a world-wide audience on TV ChessBase.